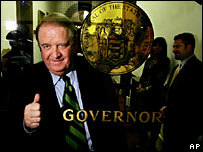 New Jersey's state assembly passed the measure by a vote of 55 to 21 with two abstentions on Monday. Both Republicans and Democrats backed it. It would create a 13-member panel to study whether the death penalty is applied fairly and is "consistent with evolving standards of decency". The commission report would be due by 15 November, with the ban to expire 60 days later. Opponents of the death penalty welcomed the move, but a woman whose parents were murdered said it prolonged her suffering. Sharon Hazard-Johnson said legislators were "slowly murdering me and my siblings," the Associated Press reported. She fought against the bill, but said she would back the commission "as long it is not meant to push somebody's hidden agenda", New Jersey's Star-Ledger newspaper reported. New Jersey's former governor James McGreevey vetoed a similar bill two years ago on the grounds that the death penalty had already been studied extensively. The US Supreme Court reinstated the death penalty in 1976 after it had been banned for some years. Since then, 38 states have reintroduced it. 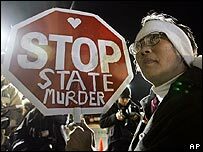 Some 60 executions were carried out in the US in 2005 - the fourth largest number of any country in the world. Support for the death penalty has been falling gradually in the United States, but remains at about 64%, a Gallup opinion poll suggested in October.